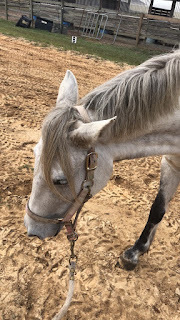 I went out Sunday morning with the plan of working Cupid in the round pen and giving her a bath, but when I got to the barn I realized that I felt like riding. I hopped on and did mostly trot work focusing on lengthening our stride and smoothing into a trot I can sit. Last fall Cupid had a beautiful trot that was easy to sit but once I stopped consistently asking her to perform it she "lost" that trot. By the end of our ride I was able to sit the trot down the long side of the arena, and maintain a nice collected (or it felt collected) trot through several laps of the arena. One area that we still need work on is maintaining our pace through circles. Cupid has a tendency to show halfway through our circle no matter how large it is. Part of me is convinced that this is because I'm signaling her to slow but am not 100% aware that I'm giving the signal. Because it was Monday I didn't make it out to the barn. Tuesday I rushed over to the barn after work. I assumed I would be alone so my plan was to take advantage of having the whole arena and working on trot and canter circles. I also planned on working on the sitting trot to maintain our progress on sitting the entire long side. My plan did get slightly derailed by the assistant trainer bringing a friend out to take a quick lesson. While I was a bit disappointed that I was going to have to rework my plan it did provide a good lesson for Cupid. Typically I like to use the entire arena and avoid cutting through the center a lot. Because of her "middle means stop" mentality, I will ask her to work through the center but it's not an exercise I consistently do. With the lunge line lesson going on at the "near" side of the arena I decided to focus on using the "far" side. Cupid quickly picked up that we were using only half the arena and seemed to enjoy having to work with shorter sides. She maintained a nice pace and did not get too distracted by the lesson going on next to us. The biggest issue I had was that when we went to canter I used the entire arena and there's a section that is consistently deep. Cupid would hit the breaks every time we would hit this spot and throw a fit when I pushed her to maintain her canter. I know this area is a bit of an issue but she attempted to take advantage of this area. We finished and Cupid got a quick bath. It poured on Wednesday. I planned on going to the barn and even had my stuff packed but the rain was too severe. Cupid is always pissy when I pull her in from the rain so I figured she would rather be left alone. She also got her feet done today and I don't like working her hard after the farrier is out. I attempted to get to the barn, then got stuck in traffic for 90 minutes. After sitting for an hour I was too irritated and tired so I headed home. By the time I would have gotten to the barn it would have been too dark to do anything. On Friday, I had to go to a graduation party for a friend. So poor Cupid spent a third day without being worked. Though my boarding contract states she can be used for lessons I'm 100% sure she isn't. Both her bridle and girth are in my locker and she never has sweat marks. I was finally able to make it out to the barn. My usual riding group was there and it was nice to be able to catch up with them. We worked on our walk to trot to walk transitions, and on sitting the trot. Cupid was super responsive and we were able to sit the long sides and post the short sides for a good 5 laps. All while maintaining a consistent pace and staying somewhat rounded. We also worked on standing under saddle for longer than a minute and standing quietly by other horses. While Cupid is horse friendly she tends to put a nasty face on when shes asked to stand with other horses, or squirm when standing under saddle. On Sunday, I finally had a lesson. It had been two weeks since my last formal lesson, and it as nice to get feedback other than "she has come so far". This lesson was with the assistant trainer and it was my first private lesson since I started at this barn. I like group lessons but it's nice getting feedback and having the attention of my trainer for the whole lesson. We focused on my two-point, keeping Cupid at a consistent pace, and not overthinking jumps. What I liked about this lesson was that the assistant trainer never uses our set course of outside - diagonal - outside - diagonal, she always uses the jumps and creates different "courses". Today was a serpentine using the jumps at the front of the arena. At the end of the lesson we did outside double to outside triple while staying in two-point during the lines. Cupid was initially squirmy and did the lines "drunk", but after doing the double-triple several times we came together as a team and hit both lines straight and stayed straight. What I find special about this lesson was the assistant trainer recorded our last triple and I got my first video of me riding. I've probably reviewed this video 20 times since I got it and have picked up on so many different things I need to work on. I wish there was a way I could record myself more so I could see what I am doing wrong. It amazes me when I look at how far Cupid has come in such a short time. I'm consistently amazed by her and find her a joy to work with.